In 1971, Gruppe 66 members were among the founders of Gruppe Lyn. 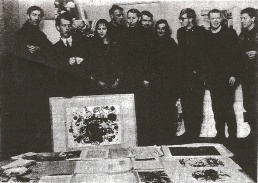 In 1977, a group of artists from Bergen, centred around former members of Gruppe 66 organised the Samliv exhibition in Bergen, Tromsø and Oslo. Documentation of Konkret analyse exhibition, 2-18 Oct 1970. Organised by Lars Grundt and Stefan Rink. This page was last modified on 9 February 2019, at 10:15.